Whether she's already a star or just getting started, she'll enjoy the flute virtuoso female brown hair personalized Christmas ornament from Russell Rhodes. These perky musical instruments ornaments personalized for the recipients are part of a series that includes a symphony of instruments and musicians with many "looks." 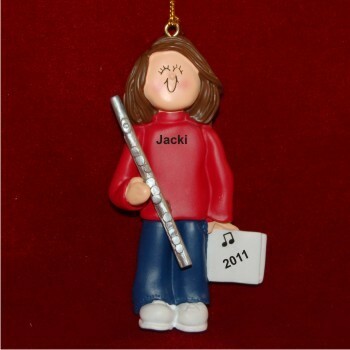 She'll enjoy displaying the brunette flute player personalized Christmas ornament in a variety of places with our golden cord that's included in our pretty and exclusive velvet gift pouch.